At the onset of the 1930’s, school township districts were thinking about consolidation. There were several drawbacks initially. Lack of adequate transportation, and roads that were impassable in the Spring. 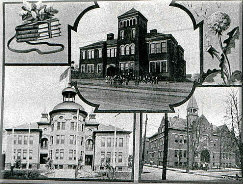 The city schools were so crowded that New Castle High School began having some students go to classes in the morning and others in the afternoon. School construction had boomed in the 1920’s New Castle built two junior high schools and new grade schools on the upper east side and upper north hill. All the townships had constructed new high schools. And Ellwood City had built two elementary schools and a new high school. With the closing of the mills during the Depression, it looked like school expansion was over. Teenagers were dropping out of school to look for work to support their families. Others were too embarrassed by not having shoes or proper clothing to keep on attending school. Many travelled from town to town trying to find a job. One of the most successful programs of the New Deal was authorized by President Franklin Roosevelt to handle this problem. He formed the Civilian Conservation Corp. (CCC) It put the young men back to work at state and federal parks. They were housed in tents or barracks, fed well, and had plenty of clothes and shoes. The program also allowed the men to complete their high school education, learn a trade and even take college courses. Governor Pinchot had authorized state funds to pave the roads. “Get the farmers out of the mud” had been his campaign slogan. 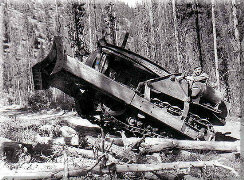 The “Pinchot” roads were two lane macadam or they were covered with ash from the mills. Working on these roads provided employment for many. When the Works Progress Administration was signed into law, men also worked on streets and roads. Some worked on new school buildings or repairing and expanding older ones. By the late 1930’s school buses were able to pick up children and bring them to more modern buildings in most townships. But Pennsylvania Law only stated that children were not to walk more than two miles to school or the bus stop. So many children still had quite a walk to catch the bus. In cities such as New Castle, the Mahoningtown students walked to George Washington Junior High School and New Castle High School, or if they could afford it, rode the city trollies or buses. It was the G. I. Bill of Rights and the “Baby Boom” after World War II that effected the biggest changes in the schools. As returning soldiers and their families were able to purchase or build their own homes for a very small down payment and low monthly payments, many decided to move to the suburbs. Others built new homes in the city. Schools were bursting at the seams. Shenango was the first to move towards total consolidation. They closed all of their one room schools and housed the overflow crowd in portable units around the high school. It wasn’t long until the township schools merged with other nearby townships to create district schools.